A permission to enter phone book page. A permission to create new person (which is a child permission of first one, as naturally). Unique name of this permission is "Pages.Tenant.PhoneBook". While you can set any string (as long as it's unique), it's suggested to use this convention. A permission can have a localizable display name: "PhoneBook" here. (See "Adding a New Page" section for more about localization, since it's very similar). Lastly, we set this as a tenant level permission. We get an error message. This exception is thrown when any method of PersonAppService is called without required permission. We see that a new permission named "Phone book" added to permissions tab. So, we can check it and save the role. 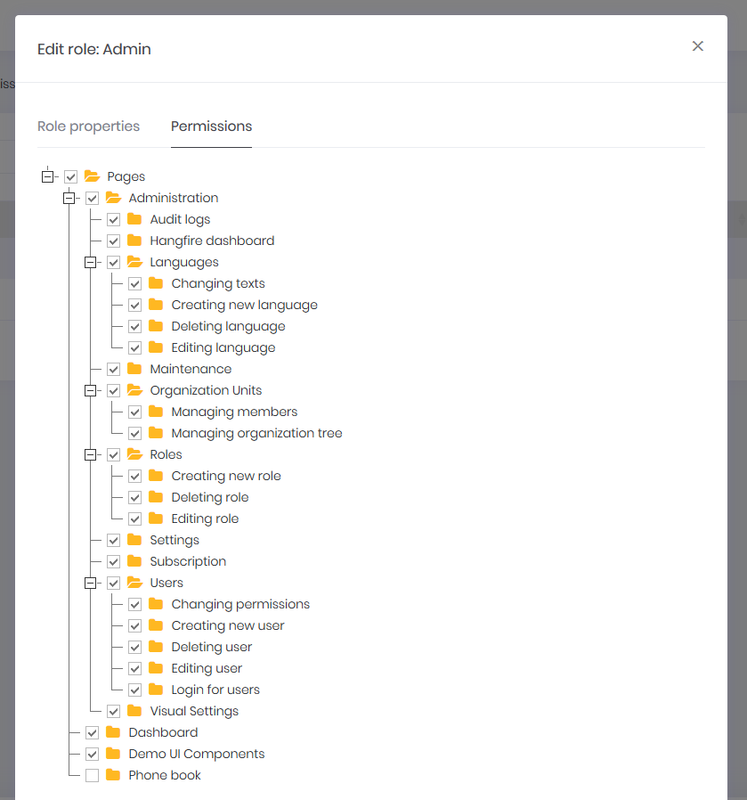 After saving, we need to refresh the whole page to refresh permissions for the current user. We could also grant this permission for a specific user. Now, we can enter the Phone book page again. While a permission for a page is useful and probably needed always, we may need to define additional permissions to perform some specific actions on a page, like creating a new person. First permission was defined before. In the second line, we are creating a child permission of first one. In this way, the "Create New Person" button does not rendered in server and user can not see this button. As shown above, Create new person permission is a child permission of the Phone book. We added Authorize attributes to PersonAppService. This prevents unauthorized calls to this service. But unauthorized clients still can call actions of PhoneBookController actions. Since PhoneBookController uses PersonAppService, they will get authorization exception and can not use the service. But we can also secure MVC Controllers. This is suggested since some MVC actions may not use application services. Also, it's better to prevent unauthorized attempts at the very beginning. See authorization documentation for more information on authorization.